Reports further said that the US Government offers the search and rescue vessel free of charge but it is expected to cost SLN an estimated $6.9m to repair the vessel, train the crew and sail it from Baltimore, Maryland to Colombo. A September 2002 assessement of armed forces of Sri Lanka by a United States Pacific Command team said that the Sri Lanka Navy which is key to SriLanka's defence must "possess long-range surveillance aircraft and maritime interdiction vessels" capable of stopping the LTTE's re-supply of arms by sea. 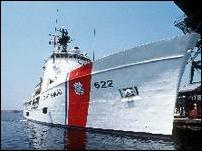 The acquisition of the coast guard cutter is an attempt to partially fulfil this assessment. However, it is also estimated additional $4m will be required to install a weapons system on board. "Courageous" is equipped with 2x2,500 h.p. 251B 16-cylinder Alco diesels which can power the vessel to a maximum Sustained Speed of 18 knots. The cruising Speed is 14 knots for a 6,100 mile range. Website containing the history of the coast guard cutters said: "The 210-foot cutters were added to the Coast Guard as part of an effort to upgrade the aging fleet of World War II-era cutters. The Naval Engineering Division designed these cutters for search and rescue and law enforcement patrols of a "medium endurance"--i.e. they could conduct patrols of up to three weeks without requiring replenishment. The outward appearance of these new cutters reflected the evolving nature of Coast Guard operations during the latter part of the 20th Century. They had sleek lines with the most prominent feature being their flight decks."